Like the Tremolo harmonica, the Octave harmonica also has two distinctive rows of holes. And each blow and draw note is also produced by two reeds, instead of the single reed of a regular Diatonic harmonica. But in this case each pair of reeds is tuned an octave apart. 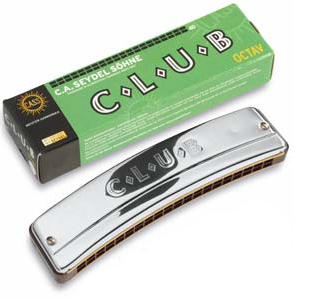 This makes a big sound which is very similar to a button accordian; making the Octave harmonica a really popular choice for folk and traditional music players. One other difference is the shape of the Octave harmonica. It’s often bowed, or banana-shaped, unlike the straighter Tremolo harmonica.